Yangzhou fried rice is also called Yangzhou fried rice with egg. 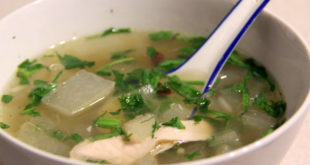 It is a popular Yangzhou specialty with a long history. It's said that it originates from a powerful minister, Yang Su, from the Sui Dynasty (581–618) and his favored dish, Sui Jin Fan (fried rice with egg). It is dazzling with many colorful ingredients. It is also a good choice to make with leftover rice. 1. Crack the eggs into a bowl and whisk them until thoroughly mixed using a wire whisk or chopsticks. 2. Cut the sausage into ½ cm cubes. Finely chop the mushrooms, carrots, red bell pepper, and cucumber. 1. Heat some cooking oil in a wok. Add the beaten eggs and fry them on a medium heat. After the eggs have set, break them up into small pieces. 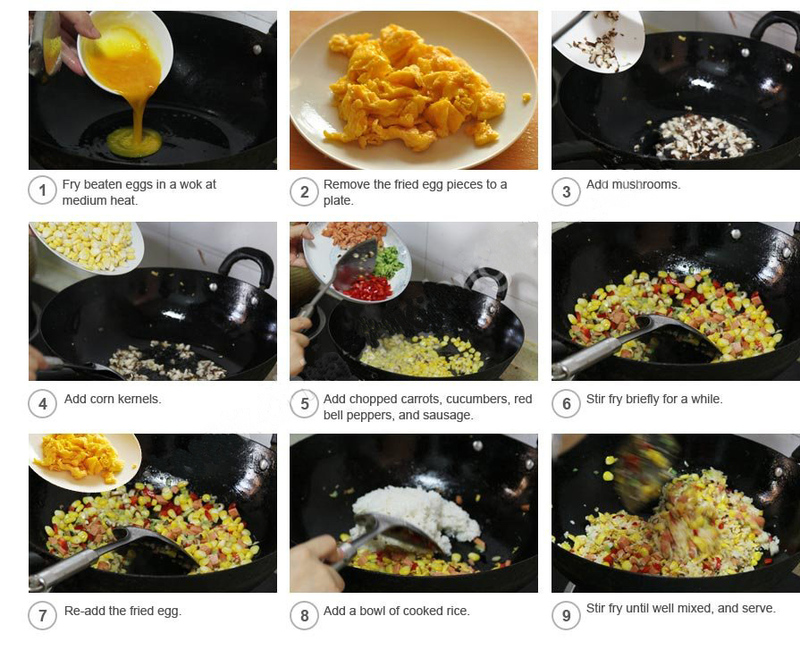 Remove the egg mixture from the wok and place it onto a plate. 2. Add some cooking oil to the wok. Add the mushrooms, corn kernels, carrots, cucumber, red bell pepper, and sausage, and stir-fry them briefly. 3. Add the fried egg mixture to the rest of the ingredients in the wok along with the cooked rice, and stir-fry evenly. 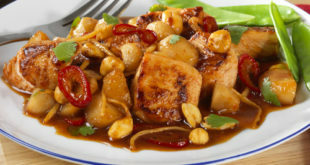 Add some salt and continue to stir-fry until the ingredients are thoroughly mixed. 4. Serve the Yangzhou fried rice on a dish for sharing or into a bowl for one person.